The 1st generation of the TI-Nspire was equipped with this alphanumeric keyboard and the TI-84 Plus Keypad was included to emulate the keystrokes and functionality of the previous TI-83 Plus, TI-84 Plus and TI-84 Plus Silver Edition graphing calculators. This allows the use of the TI-Nspire on exams permitting just the TI-83 Plus based calculators like SAT and ACT. Texas Instruments announced on March 8, 2010 the new TI-Nspire Touchpad and Operating System 2.0. The new OS 2.0, including the TI-84 Plus Silver Edition 2.54MP, was released for this TI-Nspire with Clickpad, too. With the introduction of the new calculator an optional Touchpad was announced to upgrade existing TI-Nspire calculators. Texas Instruments introduced already in 1976 an educational calculator with a total of six interchangeable keyboards! Don't miss the rare ABLE (ABstract Linking Electronically) limited function calculator. Texas Instruments announced on March 8, 2010 the new TI-Nspire Touchpad and Operating System 2.0. 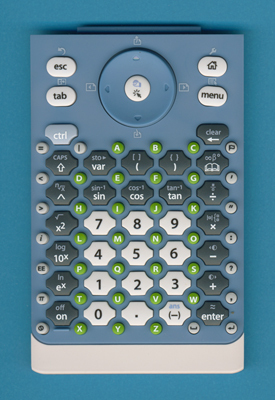 The new OS 2.0, including the TI-84 Plus Silver Edition 2.54MP, was released for this TI-Nspire with Clickpad, too.